From Philadelphia and 95 South or North – Take Ben Franklin Bridge to 38 East. Stay on 38 East for approximately 8 miles. Just after the Moorestown Mall and Nixon Drive, you will see East Gate Drive on your right-hand side. Make a right on East Gate Drive and proceed to the first traffic light (Harper Drive). Make a left at the light, and your first right into the complex to 308 Harper Drive. From the New Jersey Turnpike - Take Exit 4 toward Camden/Philadelphia. Follow Route 73 North to the exit for Route 38 East. 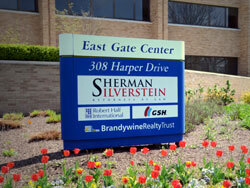 Just after the Moorestown Mall and Nixon Drive, you will see East Gate Drive on your right-hand side. Make a right on East Gate Drive and proceed to the first traffic light (Harper Drive). Make a left at the light, and your first right into the complex to 308 Harper Drive. From Interstate 295 – Take 295 to Exit 40B (toward Moorestown). Go west on Route 38 for approximately two miles. You will turn left onto Pleasant Valley Avenue. Turn right onto Harper Drive. The building (308) is on the left-hand side.